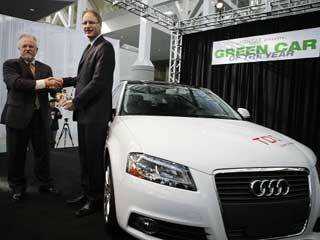 It was an Academy Award-esque shocker at the Green Car Journal’s 2010 Green Car of the Year awards on Thursday. The award, bestowed at the LA Auto Show each year, honors the vehicle that had the greatest positive impact on the environment. The 50 mpg third-generation Prius, in the eyes of many observers, certainly seemed a shoe-in for such honors. However, when the award was announced, it was Audi, not Toyota accepting the honors. The 2010 Audi A3 TDI, a vehicle with a clean diesel engine, took home the trophy. The sporty, yet economical car features 42 mpg highway and 32 mpg city fuel economy on a 2.0L 140-horsepower inline-4 diesel engine. Priced from $29,950, the vehicle retails for a bit more than the Prius, but features some additional luxury touches. The award demonstrates a logical shift in thinking for the green community that has long been missing. The thought is that while hybrids and electric vehicles, which feature smaller sales, are good, mass market vehicles are better. That sentiment was echoed in the enthusiasm green car advocates showed for small fuel-efficient vehicles at the LA Auto Show, including the Chevy Cruze, the Hyundai Sonata, Volkswagen Golf TDI, and the Ford Fiesta. With the new generation of fuel-efficient gasoline and diesel engines coming online, combined fuel economies in the 30 mpg to 40 mpg range can finally will be realized. If these vehicles can comprise the majority of sales, displacing vehicles with traditional fuel economies of around 20 mpg, this will lead to a third less fuel consumption and carbon emissions. This year’s Green Car of the Year® jury includes six environmental and automotive experts plus a smaller number of Green Car Journal editors. Invited jurors include Dr. Alan Lloyd, president of the International Council on Clean Transportation; Carl Pope, executive director of the Sierra Club; Jean-Michel Cousteau, president of Ocean Futures Society; Matt Petersen, president of Global Green USA; automotive expert and television host Jay Leno; and automotive icon Carroll Shelby.